A magnitude-7.2 earthquake struck Papua, Indonesia, on Friday morning at 11:25 a.m. local time, according to reports by the U.S. Geological Survey (USGS). Following this large temblor were multiple aftershocks, one of which registered magnitude-6.1 on Sunday at 4:36 p.m. The main pulse and the aftershocks resulted in 19 deaths, more than 180 people reported injured and at least 300 buildings destroyed. 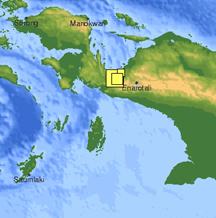 Multiple earthquakes have struck Papua, Indonesia, in the past month. The overlapping yellow squares indicate the areas affected by the the most recent temblor and its aftershocks. Larger squares indicate higher magnitude quakes. Image courtesy of USGS. Police Commissioner Wempi Batlayeri told the Agence France-Presse that continuing tremors and aftershocks are preventing Papua residents from going home, and they are setting up makeshift camps to protect themselves from the rain. Patients at a state-run hospital are also being treated outside, as officials are fearful of a collapse due to structural damage to the hospital. The Indonesian Red Cross is helping survivors and displaced residents by providing medicine, tents and mosquito nets. Sandwiched between four tectonic plates, Indonesia is one of the most tectonically active regions in the world, according to USGS. Two weeks prior to this large quake, on Nov. 12, a magnitude-7.5 earthquake struck the eastern Indonesian island of Kepulauan Alor (see Geotimes coverage).